As the summer hot’s up so are all our weddings in Barcelona, one of the most authentic and stunning Cities that graces the Spanish mainland. If you are looking for a wedding destination which has international air links and where you guests can easily fly to either from the UK, parts of Europe, and also worldwide, then choosing to get married in Barcelona would be a great option. Each Spanish wedding destination offers a mixture of different wedding settings and venues. Having your wedding in Barcelona provides you with a choice of stunning rustic wedding villa venues in Barcelona set in rural countryside. The villa venues provide a great alternative for your wedding party from staying in a hotel with some villa’s providing accommodation for up to 30 guests, creating a more intimate feel to your wedding in Barcelona. By hiring a wedding villa venue in Barcelona your guests will have a completely unique experience from their accommodation in Barcelona City centre or one of nearby neighbouring beach resorts. Your wedding villa venue can also be the setting for a post get together where many bridal couples invite their guest back the following day to enjoy a pool party offering paella or a BBQ to soak up the alcohol from the previous nights celebrations. 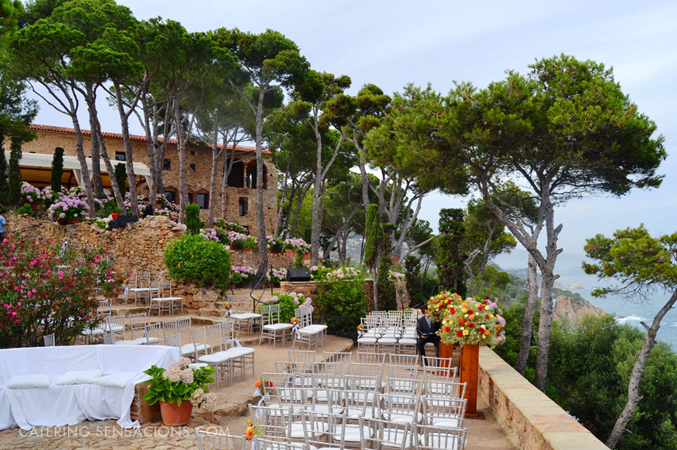 The most popular wedding venues in Barcelona are rustic; this style of wedding venue in Barcelona provides a traditional and authentic atmosphere creating an exclusive and unique feel to any wedding in Barcelona. For those bridal couples who dream of a rustic sea-view wedding venue in Barcelona then the drive is about an hour to the Costa Brava where hidden treasures can be found over looking the waters edge. This choice of wedding venue in Barcelona provides an alternative to the City where guests can stay for 1-2 nights in costal towns near to the venues to get a flavor of the sea air. Alternatively for those wedding parties that would like to stay in the City, transport can be arranged where guests can be taken from the centre of Barcelona to the venue and back again after the evening has finished. One of the many great experiences of hiring your own wedding venue in Barcelona is that you can bring in your own caterers who can create whatever style and theme of wedding food you prefer. The food is exquisite adding to the overall atmosphere of having your wedding in Barcelona. Whatever type of rustic wedding venue in Barcelona you choose one thing you can be sure of is that you will have a wedding that has a traditional and authentic Spanish feel in a stunning setting where guests will get to experience mouth watering food and where memories and friendships will be made for the not just the bride and groom but all your guests at your wedding in Barcelona.